I am delighted that Miami Business School has been selected to replace UNC as the US partner in the global five-school MBA consortium known as OneMBA. Miami Business School is a global business school. This partnership bridging schools in Europe, Asia and the Americas further cements this positioning. Please see below for the full press release. OneMBA®, the truly global executive MBA program offered in partnership by renowned business schools around the world, announces that University of Miami Business School has joined its consortium as the new American partner, succeeding the role previously assumed by the University of North Carolina Kenan-Flagler Business School. “When the USA is looking inward, we at Miami Business School proudly reaffirm our commitment to global dialogue and mutual support by joining the OneMBA family of schools,” said John Quelch, Dean of Miami Business School. Miami Business School, founded in 1929, is reputed for its forward-thinking leadership and agility, and is focused on global partnerships. Its mission is to develop innovative ideas and principled leaders that transform global business and society. Its graduate student enrollment increased by 12% in 2018, demonstrating the draw of its academic programs and location. One of 11 schools and colleges at the University of Miami, the School offers undergraduate, master’s, doctoral, and executive education programs. With its location in a major center for international business, the School is acclaimed for its global perspective, student and faculty diversity, and engagement with the business community. With the addition of Miami Business School, the consortium gains a partner, which is a leader in preparing individuals and organizations to excel in the complex, dynamic, and interconnected world of international business. 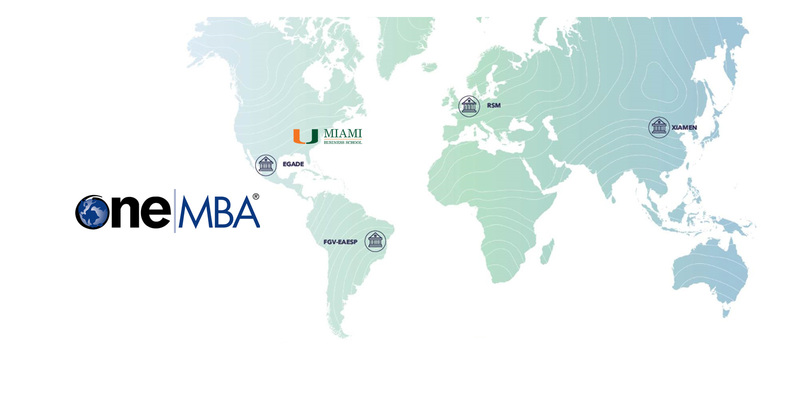 “The OneMBA community welcomes Miami Business School into the consortium. UMBS is recognized by its focus on innovation, diversity and ethical leadership – values that resonate deeply with OneMBA spirit and that direct our efforts of developing ever more open-minded, responsible and creative global leaders. We are all greatly impressed by the professionalism, commitment and passion of the UMBS team. OneMBA thus reinforces its distinctive position as the truly global executive MBA program,” says Jorge Carneiro, Chair of the OneMBA Executive Committee and Associate Dean and Professor of Strategy and International Business at FGV. Global residencies: OneMBA participants from all five schools come together for four week-long global residencies held on four continents, which cover countries that represent around 50% of the world’s GDP. They visit regional and multinational companies and attend lectures by local executives, entrepreneurs, public policymakers and professors, besides engaging in social immersion – as an experiential way to understand different perspectives on doing business. Global courses: Between residencies, OneMBA participants attend globally-coordinated courses at their local OneMBA partner schools. Regional courses: Each partner school offers regional courses that accelerate career success in its world region. Along 21 months, students engage in multiple global teams (purposefully arranged to include diversity in terms of nationality, cultural background, academic background, industry and functional area experience, as well as gender and age) in order to conduct major projects that require working remotely with global team members from the other partner schools. Designed for business professionals who live and work around the globe, OneMBA was launched in 2002, and graduated its first class in 2004. Today its network of 1,400 alumni in senior leadership positions extends to over 50 countries. Learn more about OneMBA at http://onemba.org/. For media inquiries, please contact Kendra Parks at (305) 284-3775 or by email at kparks@mbs.miami.edu. For academic inquiries regarding OneMBA, please contact Vice Dean Patricia Abril at pabril@mbs.miami.edu. For admissions-related inquiries regarding OneMBA or any other MBS graduate program, please contact Jennyfer Puentes, Director of Admissions, at jpuentes@mbs.miami.edu.